Our component has been utilizing FiltaFry’s full fryer management service for 6 months now. We have experienced several benefits from the service, which include; an increased life of our cooking oil, which results in a reduction of oil usage and cost savings. Our fryers are much cleaner now and are properly calibrated on a consistent basis. Filta has removed the carbon build up on our fryers, which has translated into superior food quality. 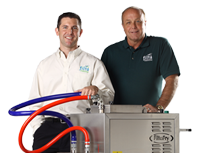 I highly recommend the FiltaFry service if you are seeking improved quality of food, environmental conservation, increased equipment life, and an overall reduction in operating costs.